Nice to meet you! Welcome to ExMarkets. After a year and a half of back-end development, bug fixing, user interface enhancement, connectivity, and security testing, our team is extremely proud to announce that ExMarkets trading platform is deployed and running. Now accessible to anyone, market orders are successfully connected to CoinStruction back-end framework to provide deep volume and thick orderbooks with a proprietary clearance mechanism, utilizing valid orders of major crypto exchanges, and maintaining users’ balances secure at all times in Coinam cold wallet for maximum security. Simply because ExMarkets is not just a standalone crypto exchange. ExMarkets is an integral part of the CoinStruction ecosystem, a crypto liquidity framework consisting of two cryptocurrency exchanges, a digital wallet and a soon-to-be-launched digital OTC desk for institutional clients and corporate investors. We have a team of professionals who are working day and night on overcoming obstacles currently present in the crypto market in order to make the industry more efficient and a fair game for all participants. What we do differently is we do not rely solely on placed orders of our own exchange — we integrate bids and asks of our partner exchanges connected to the CoinStruction liquidity framework to increase the thickness of the orderbooks, tighten the bid/ask spread and increase the overall market efficiency. Just recently we partnered with Global Traders Team and will be bringing a selection of experienced professionals on the platform to trade and coach aspiring traders how to improve their results and will provide tips on personal money management. ExMarkets trading department will be following the performance of our users and if our algorithms identify individuals who tend to accumulate losses on a consistent basis, we will reach out to them and offer to hop on a call with one of our designated coaches to discuss their trading strategies and how to improve them. To some it’s a well-known fact, to others it’s a mystery but there’s an outstanding prevalence of cryptocurrency exchanges to put an additional cost on their clients in a form of hidden fees. But what is not always publicly disclosed is the way that hidden fees are integrated into the trading. A significant number of trading vendors are marking up their orderbooks by a hidden percentage to make an extra commission from facilitated trades. Most often than not, this information is not presented or known to the traders. Try out our user-interface and let us know what you think! We appreciate all feedback. AERUM tokensale is live on ExMarkets trad. Rush to ExMarkets trading platform and claim your XRM. Price increases every week! $4 million of funding already secured! AERUM's mission is to provide a complete infrastructure for permission-less financial Applications serving a decentralized economy, with real-time and free transactions to consumers and nearly unlimited scalability. Aerum provides a full-service platform to launch financial marketplaces, prediction markets, gaming ecosystems through its unique offering. The long-awaited AERUM tokensale on Exmarkets will run from Jan 24th until March 31st, 2019. Purchase of XRM token is available using Ethereum (ETH). XRM/ETH price is programmed to increase every week until tokensale terminates. Some merry news for Friday: new listing for ExMarkets confirmed. USAT or The United Scientists Association of Technology Inc. operates as a digital incubator for highly profitable and novel commercial ideas. The USAT Inc. platform can quickly and efficiently take a product to market via a decentralized platform, whilst maximizing returns for all stakeholders. Using a blockchain-enabled IP storage system, the IP can remain protected through all the evaluation stages leading to commercialization. 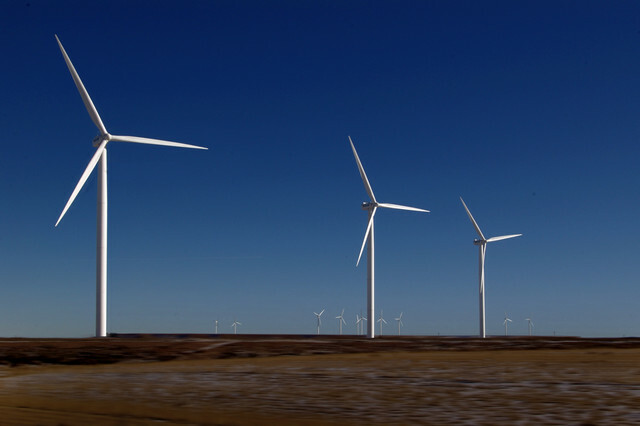 The platform has proven it can successfully take IP from commercialization to exit with its flagship project, solar-wind technology, and will be launching its second project by the end of 2018. Stay tuned. More information coming out soon! 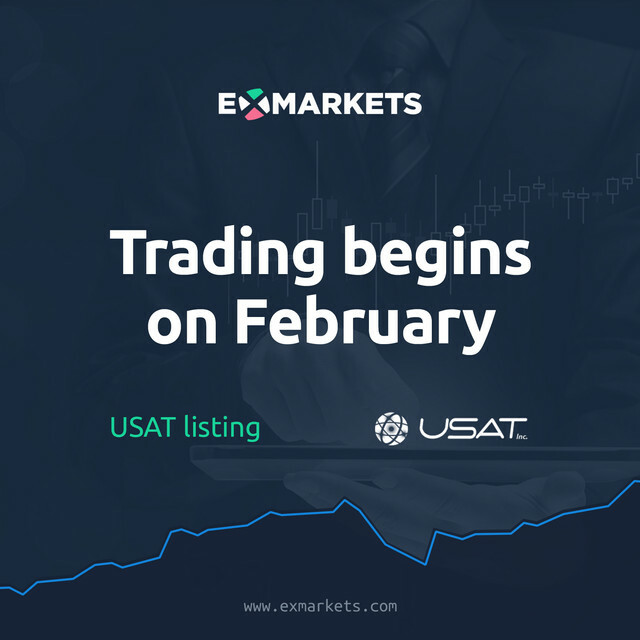 The United Scientists Association of Technoloy Inc.( or USAT Inc. for short) is going to be listed on ExMarkets cryptocurrency exchange on the beginning of February. USAT is acting as an enterprise incubator for the most innovative business ideas with the highest upside potential. USAT utilizes its own Intellectual Property (IP) infrastructure which enables it to launch products to market in a particularly rapid and secure fashion. 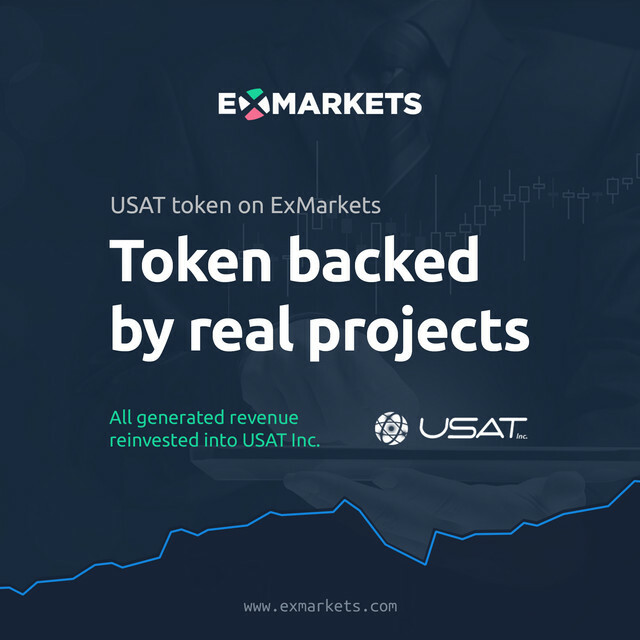 What makes USAT stand out from other token-based projects is the fact that it has a guaranteed revenue pipeline instantaneously giving real value to their native USAT token. Moreover, USAT Inc is a non-profit organization meaning that all generated revenue will be reinvested into organizational and architecture development. USAT is an ERC-20 token which grants token-holders access to the incubator platform and acts as the medium of exchange on it. There are in-built token velocity mechanisms which make USAT token increase in demand, a mandatory requirement for all technology purchases to be partially (at least 15%) made in USAT tokens. USAT ends its ICO on the 31st of January and will be listed on the secondary market by February 6th. ExMarkets is thrilled to become a liquidity partner of the Australian organization that utilizes the blockchain architecture to provide an accelerator for the most promising technology-oriented products. We feel that given USAT’s sound token economics and far-reaching application potential, there are strong implications for the uptrend movement of the token’s implicit value on the secondary market. Just recently CoinStruction acquired licenses from the Estonian regulator for fiat-to-crypto gateway and custodian solutions and is on the road to becoming a fully EU-regulated crypto liquidity ecosystem. Do not delay your registration and open up your account on ExMarkets immediately to be completely ready when the time comes. Rush to ExMarkets and register! 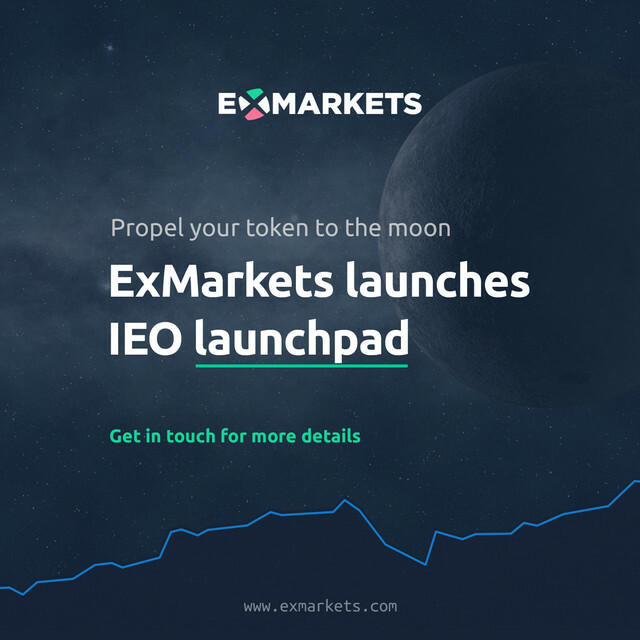 ExMarkets LaunchPad - an awesome vehicle to carry out a tokensale by doing an Initial Exchange Offering (IEO). Multiple projects already scheduled to go! Follow the news and find out all about it! 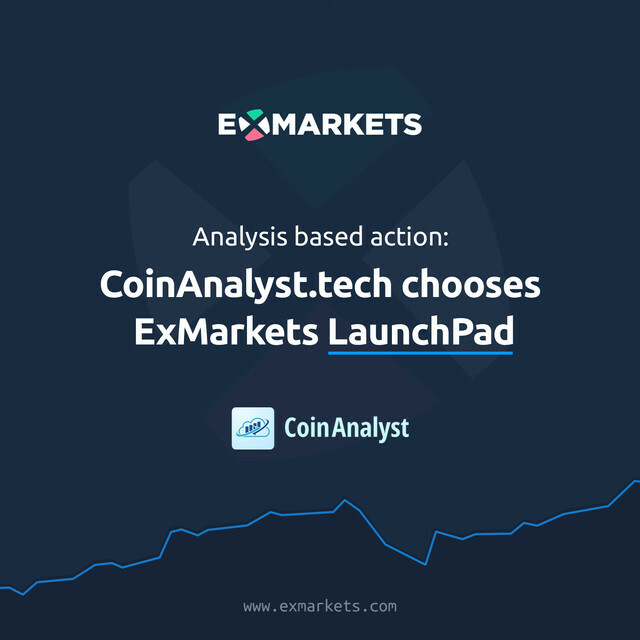 On the 22nd of February, CoinAnalyst (COY) token will be available for acquisition on our LaunchPad. CoinAnalyst opened its tokensale in July and will conclude on the 31st of March. Wanting to give the COY token an additional boost, CoinAnalyst team decided to propose their token to a wider audience and add extra assurance for the community by bringing it to an Exchange. ExMarkets is happy to be of service and provide a reliable gateway to buy, hold and, when the time comes, trade COY tokens. Register an ExMarkets account right away. Trading starts at 11 AM GMT, February 22nd. CoinAnalyst is an AI-based data analytics platform which gives professional traders required market insights to improve their trading success and achieve extra profits. The platform operates in real-time and helps to achieve decision-making certainty at the time of trade execution by allowing its users to identify risks and opportunities in order to react proactively and in a rapid manner to price fluctuations. The technology developed by CoinAnalyst helps to make the cryptocurrency market more transparent through a way of providing real-time market information. The analysis provided by the technology is based on market sentiment or ‘mood’ which is assessed by mining the internet for textual imprints related to a said coin or token. Mined information is classified into one of the three sections: positive, neutral and negative and attributed to a coin in question. Currently, CoinAnalyst tech supports 9 languages with more to be integrated in the future. CoinAnalyst’s algorithms are based on the technology of Cogia Intelligence that is employed by a number of Fortune 500 companies already. There are a number of reasons why the CoinAnalyst project seems to be a solid investment opportunity and represent implied value behind the project. First of all, CoinAnalyst has released their Alpha version and is encouraging seasoned traders and novices to be the first platform testers. You can apply to be CoinAnalyst tester here. Moreover, CoinAnalyst project is a member of Enterprise Ethereum Alliance — a member-driven organization which is aiming to develop open blockchain specifications to drive interoperability and harmonization of practices in order to facilitate global blockchain adoption. As of now, the Enterprise Ethereum Alliance holds more than 380 companies and over 1,600 individual members. Last but not least, the project’s smart contract is verified by TokenGrade — an auditing platform providing white paper and source code synchronization, verification and contract security reviews which are verified by legal experts. CoinAnalyst’s native token ticker is COY, it is an ERC-based token used internally in the platform to pay for the services. On top of that, the team behind the project spent some time thinking about the token velocity and has implemented a few neat features that should help the token to maintain and increase in value. There are several advantages of appearing on the ExMarkets launchpad. A token sale run on a cryptocurrency exchange ensures the certainty that there will be a market for issued tokens — people will be able to trade and sell their tokens on the exchange immediately. Also, IEOs prevent Gas Wars from happening and significantly reduces the possibility for copycat scam artists to trick people of their money. Register an account on ExMarkets and gain access to the best assets the cryptocurrency space has to offer. 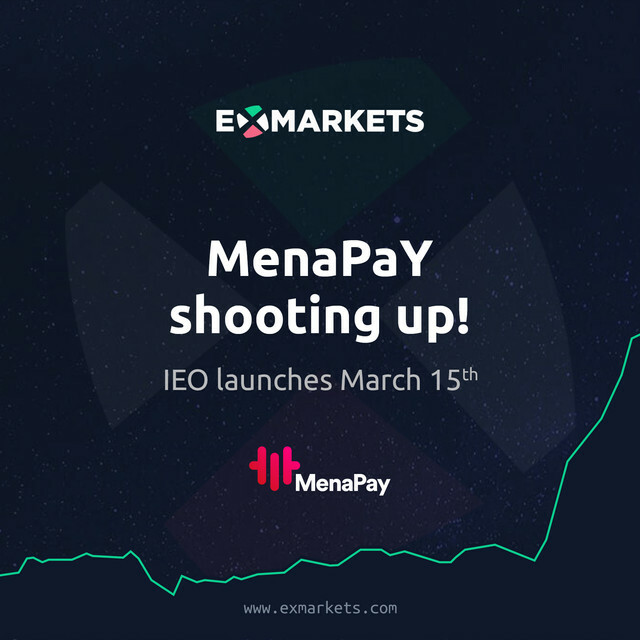 The Middle East and North African (MENA) payment processor startup MenaPAy has picked ExMarkets LaunchPad to conduct its tokensale. The ability to purchase MenaPay tokens will turn on right in the middle of the following month - March 15th. MenaPay is a payment system oriented to help the MENA region and its younger part of the population to control their finance, make payments and transactions easier, faster and more secure than anytime before. Visit ExMarkets and Sign Up Today! 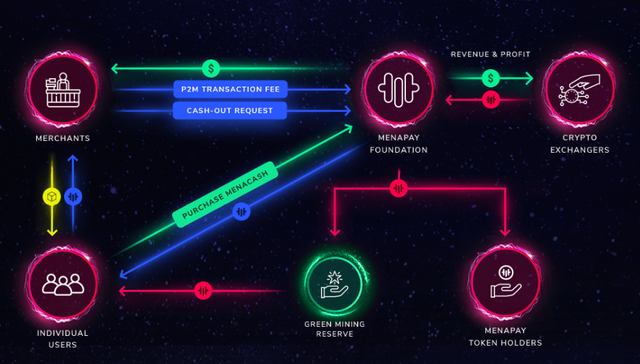 The extensive and far-reaching team of MenaPay is creating a new standard in the crypto industry for the level of participatory returns, beyond the regular incentives for users and investors. Its multi-faceted business model will fight for market share in the following areas: P2P Transactions, P2M Peer to Merchant Payments, M2F Merchant to Foundation and Green Mining. Regarding product selection, the project also have its hands full on developing a few interrelated offerings at the same time. GM of Menapay, T. Odoglu said: "We plan to covenant with 200 exchange platforms by the end of February, and at the beginning of June, MenaPay tokens can be exchanged with other currencies on the exchanges." MenaPay’s development team has a visionary leader who distributes objectives between the team members according to their abilities and closely monitors their performance to achieve optimal results and allocate resources effectively. Close mutual cooperation is one of the cornerstones allowing the team to quickly progress along their official roadmap. The research made in Turkey regarding financial literacy implies that the younger generation is not educated enough and 31% of ages 15 and above still do not have access to banking services. What is more, around 75% of youngsters in the region do not know the meaning of the word inflation. MenaPay is getting ready to revolutionize the habits of spending money and managing funds of the entire population in Turkey - mostly aiming for the young population. The application replaces traditional payment methods with a blockchain-based, fully-backed cryptocurrency to provide a secure and transparent payment processing vehicle. MenaPay is creating a new standard in the crypto industry for the level of participatory returns, beyond the regular incentives for users and investors. There are numerous reasons why an IEO seem to be a more feasible decision for upcoming projects. First of all, it’s an instant assurance to the project community that their token will have liquidity after the tokensale ends. Moreover, doing an IEO makes it harder for Telegram and Twitter frauds to try and scam project supporters out of their funds by direct messaging them and trying to convince to send their valuable Ethereum or Bitcoin to the wrong wallet address. Also, IEO provides an additional buyer audience - native users of the chosen exchange that are already using the cryptocurrency exchange to buy, hold and trade their digital assets. The spring of 2019 brings about a project with a positive and honorable mission to increase the global share of electricity generated through renewable energy and other ‘green’ sources. 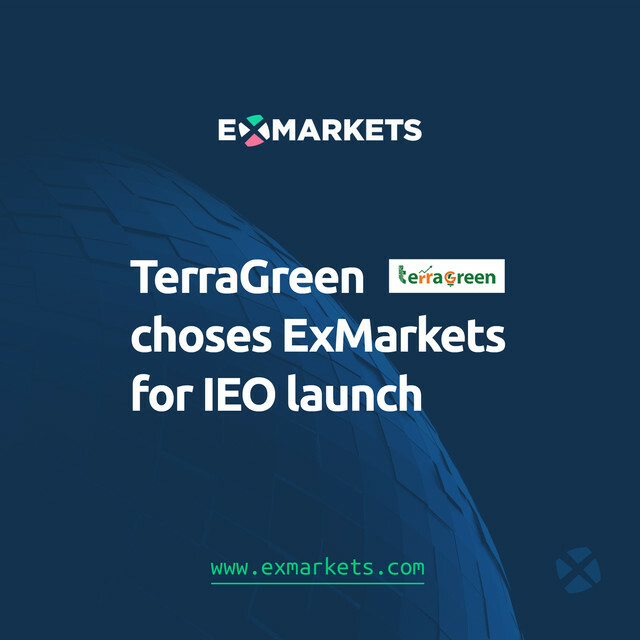 TerraGreen team selected ExMarkets to be the place of their Initial Exchange Offering (IEO). “We like how ExMarkets launchpad is structured and provide a simple and intuitive solution to buy TerraGreen coin. They have an easy onboarding process, registering an account takes only a few clicks. We are certain that our community will appreciate it as well.” - Brad Lee, CEO of TerraGreen. TerraGreen is on a mission to facilitate the ‘Energy Transition’ from the traditional ways of production to renewable energy sources and further develop the efficiency and infrastructure of the latter. There are a number of bottlenecks in the renewable energy sector in the supply, technology, and financial sectors but the TerraGreen’s blockchain-based renewable energy trading platform is structured to bring all involved parties, including but not limited to biomass. suppliers, renewable energy technology developers, power producers, enthusiasts, long-term believers and of course, investors in a middleman-free trading ecosystem. “Here at ExMarkets and CoinStruction, we are all supporters of renewable energy and reducing waste on our environment. We believe in TerraGreen’s cause to make the renewable energy sector more widespread, competitive and efficient. There is no doubt that this project has a bright future ahead.” - A. Svirskis, Head of Strategic Partnerships at CoinStruction. Standardized: Digital Smart Energy contracts provide flexible yet standardized power purchase process. Transparent: Blockchain-based technological solutions allow fully transparent energy trade accounting. Efficient: Simple fundraising process saves you time and resources, for the project developers and energy buyers. Tradeable: Smart Energy Contracts are easily tradable within the platform – pay only for the energy you use. The solution of TerraGreen is a three-dimensional module which is comprised of a trading system based on a blockchain with an integrated AI algorithm to take care of fair and real-time order-matching, Energy Token Creation to tokenize Energy, a storage system which will keep the balances of locally produced ‘green’ energy, and DirTHG Appliances which will remove the need for repetitive power conversions and will improve the competitiveness of renewable energy. This module, together with practical solutions currently at hand will help to reduce the heat-trapping emissions - one of the main causes for global warming. Also, IEO provides an additional buyer audience — native users of the chosen exchange that are already using the cryptocurrency exchange to buy, hold and trade their digital assets. Who doesn’t like computer gaming these days? We’re getting to the point where computer games and gaming championships are gathering almost the same amount of attention as the global sports matches and gamers becoming full-blown celebrities. Here at ExMarkets, we’re also gaming fanatics. 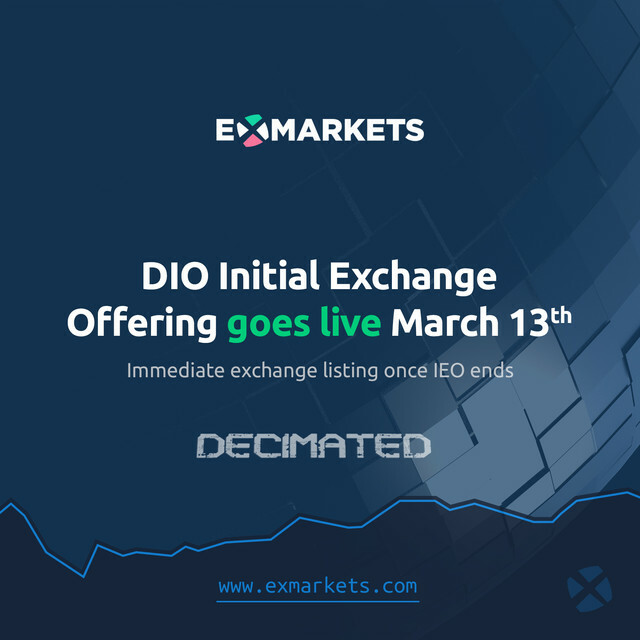 Due to this reason, we’re very excited to announce that Initial Exchange Offering goes live from the 13th of March for 14 days with an immediate DIO listing on ExMarkets afterward. DIO is the native currency of Decimated (Link:https://www.decimated.net/), a blockchain-based post-apocalyptic survival game with true digital scarcity and item ownership. It’s like Fortnite but with real currency that can be redeemed and sold for bucks, Euros or British Pounds. Isn’t that cool? “I am a closet gamer and can’t stay away without trying what’s new on the market. The gamer community are avid adopters of novelty, including blockchain technologies. I believe there’s a natural synergy between gaming and blockchain, especially when we’re talking providing a real-world value to gaming items. There’s gonna be a huge market for that, mark my words” — said G. Trilikauskis, the Marketing Strategist at ExMarkets and CoinStruction. As always, the early bird gets the worm so don’t miss out your chance to get your stash of DIOs in advance to reap the benefits of it later. Jump to www.ExMarkets.com to open up an account right now. Once again, buying starts on March 13th and will last for 14 days. On March 27th, DIO will be listed for trading. The game is a situation in future Earth after the civilization has been severely damaged by the toxic climate change caused by prolonged neglect by the governments and global corporations. The rich have managed to flee Earth in search for other habitable planets while leaving the unwanted — prisoners, rebels and the poor behind. Everyone left on Earth has to manage on their own scavenging, looking for resources in the fiercest and darkest places, trying to stay away from the cyborg police patrolling the wastelands to maintain their totalitarian rule. Players salvage resources, technology, and digital currency, repair vehicles, build bases, fortify shelters, hunt, ambush, loot and trade in this hostile post-apocalyptic environment. It’s a true bomb, isn’t it? Fuelled by the Unreal 4 engine, Decimated is building a 64 square kilometer persistent Online World like no other to act as the battleground for thousands of online players. The team has extensive game development experience and has helped to launch some of the biggest blockbuster games such as the God of War, Paladins, Injustice 2, Batman: Arkham Origins and more. There’s already a waiting community of over 40,000 people anticipating to be the first ones to test the gaming environment. The first alpha version of Decimated is planned to come out in 2020. If you consider yourself to be a gamer right to the bone, right now is the best opportunity to acquire DIO tokens, the native currency of the Decimated ecosystem and give yourself the chance to succeed and evolve faster in the game. There’s no downside as the tokens will be redeemable on the global cryptocurrency market and at any time you’ll have the opportunity to trade DIOs to Bitcoin, Ethereum or other cryptocurrencies out there. On March 13th, ExMarkets is becoming one of the terminals where you’ll be able to acquire Decimated currency online. Get it now, while it’s still cheap! Visit ExMarkets to Sign Up! A few clicks are all it takes! Pleasant news and favorable evaluations are reaching us from all over the place. We’re excited that the timetable of ExMarkets IEO LaunchPad is getting even busier. Just recently, we have reached an agreement to host the Initial Exchange Offering of Airsave Travel - a social saving app which is built for users to save and earn money for their travels. The IEO starts on May 1st! Airsave Travel already has a deployed its application on the App Store and the funding secured throughout the tokensale process will be used to create a fully-decentralized version. ASTC, the internal token of the DApp, will serve the function of a utility token and will be used to save and earn digital currency for traveling. The Initial Exchange Offering has been agreed to launch on the 1st of May 2019 and will run for 90 days until the 31st of July 2019. Project backers and contributors must be registered users on the ExMarkets Cryptocurrency Exchange! Go ahead and register an account in advance. 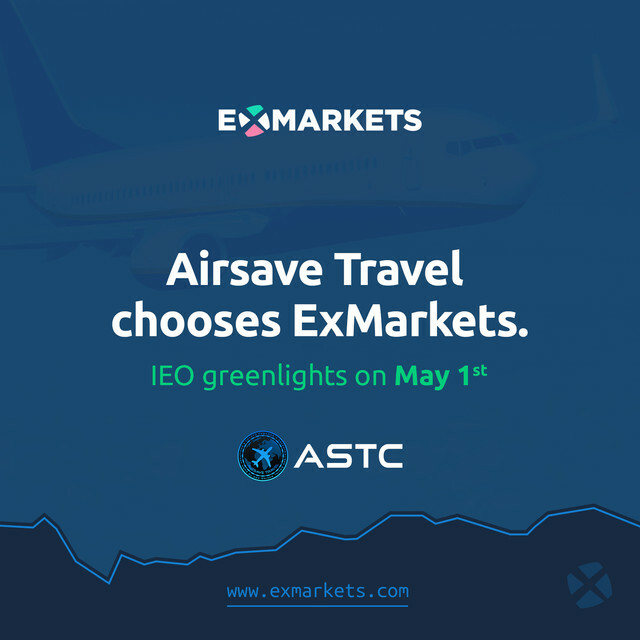 There are a total of 35M of Airsave Travel tokens in circulation, 22M of which will be available during the token sale for purchase on the ExMarkets LaunchPad. To make the deal sweeter for early investors, the first 2,000,000 of ASTC tokens will be offered at a sale price of 0.3 US$. There will be an economic benefit to those who choose to be among the first ones getting in, so don’t miss the opportunity to secure your share of ASTC tokens as soon as the sale starts. The first 2M tokens are expected to be grabbed in the first few hours of the sale. Jump to ExMarkets.com to open up an account right now. Once again, the IEO starts on the 1st of May 2019! Global tourist movement is expected to surpass 1.4 billion trips in 2019 while the sales of travel-related products will record a healthy growth to reach US$2.7 trillion. Airsave Travel is penetrating the market by bringing the end-users a more flexible, efficient and intuitive way to save and organize their travel expenses. Airsave Travel is introducing ‘Social Saving’ - a way for people to earn real money for their travels and friend referrals through the utilization of groundbreaking blockchain technology. Most people dream of being able to experience the world from a different viewpoint, but while it is one thing to dream, it is quite another thing to put together the finances to make it possible. But meaningful friendships can build lasting bridges: now, through the usage of Airsave Travel partnership with Smart Trip Platform, a decentralized ecosystem which connects travelers and travel service providers, you can combine the power of the blockchain with your Facebook friends list, and use it to save and earn money to make your travel goals a reality. Airsave Travel launched its centralized application in 2017, gaining several thousand downloads - primarily in China. You can download the Airsave Travel App for iOS on iTunes. Since then the project has been putting efforts in order to migrate the application and make it 100 percent decentralized through blockchain technology. The application allows users to track and redeem savings and earnings every four months in tokens to spend on decentralized travel, or up to 80% in BTC (the rest in travel tokens). The Airsave Travel App is built with a back-end system designed to track and manage earned Airsave Miles through the admin panel when users save money for their travels with their friends. It effectively tracks all users’ referrals and travel earnings, which is paid out to users at four-month intervals. “We are looking forward to the Initial Exchange Offering of Airsave Travel. Their platform provides multidimensional benefits to travel aficionados. The platform allows users to earn an income and increase their fixed investment – based on the number of referrals they make, which they can redeem in decentralized travel tokens.” - Dylan Sharkey, Head of Sales at CoinStruction and ExMarkets. Save and earn: Save with 10 friends to earn an equivalent of £240 every four months. Save with 50 friends to earn £1040 every four months. Refer your friends: Earn money for referring your friends to Airsave Travel. See your Facebook friends pop up on your referral list. Fairly recently ExMarkets was granted 2 operational licenses for crypto-fiat gateway and custodian service provision by the Estonian regulator making it one of a few certified players in the market. It takes only a few minutes to set up your account and users are allowed to make deposits in Bitcoin, Ethereum, other supported cryptocurrencies, tokens, and most importantly Euros. To top it all off, ExMarkets is a part of the CoinStruction liquidity framework which is aggregating order-books from the most well-known cryptocurrency exchanges guaranteeing 24/7 crypto liquidity — a feature which can seldom be seen in the current market. All IT solutions and technology of ExMarkets and CoinStruction’s services are developed in-house guaranteeing that all security threats and third-party associated risks are kept at minimum levels throughout all stages of product deployment. 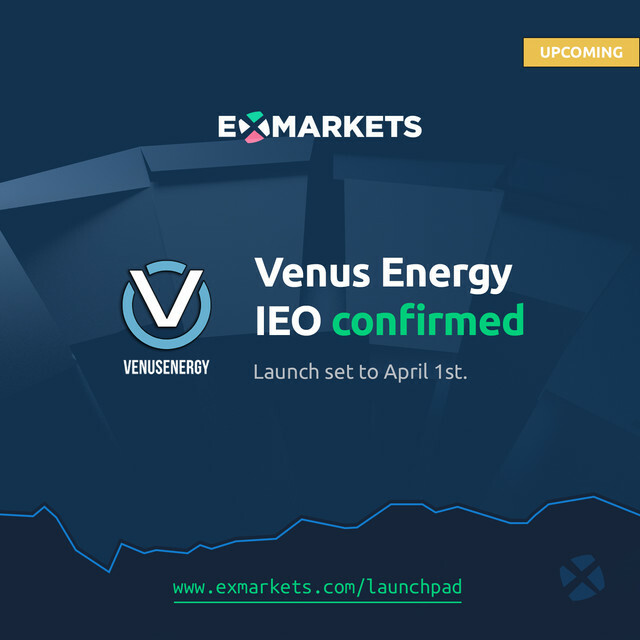 Winding up the IEO schedule to the max — VenusEnergy has confirmed their IEO and will initiate it on the ExMarkets IEO LaunchPad. The buying of VENUS greenlights on the 1st of April, 2019. VenusEnergy IEO will run for 2 months and will close on the last day of May, the 31st. Each of the two months will have different prices levels, so it’s far more economically sensible to invest early in order to reap a larger share of the rewards. Buying of VENUS will be available for two cryptocurrency pairs — VENUS/BTC and VENUS/ETH. Once, the IEO ends VENUS tokens will be immediately listed and available for trading on ExMarkets and other international cryptocurrency exchanges. “We are excited to host VENUSEnergy IEO on ExMarkets. A significant part of the ExMarkets core team is Lithuanians, as well as the team of VENUSEnergy. The communication is way faster and consistent, there are no cultural or timezone barriers. It makes everything a lot simpler.” — Artūras Svirskis, Head of Strategic Partnerships at CoinStruction. There was no shortage of headlines in the media ridiculing the amount of energy consumed when mining Bitcoin and other cryptocurrencies. Moreover, it is true that the crypto hype has somewhat lost its acceleration, new cryptocurrencies and blockchain-related projects are still being born every day. The electric consumption is growing daily, while the rewards received for solving the cryptographic tasks are no longer big enough to cover the expenses. Today’s top-grossing energy sources are natural gas, oil, coal, and conventional nuclear power. According to local meteorologists, the average wind power mediates somewhere between 6.5 and 7.5 meters per second. Based on these figures, financial estimates suggest that wind power plants generate a 12.5% ROI which equals 8 years to reach break even. And that’s only for the energy generated — given the potential of cryptocurrencies the remuneration for such activity may increase tenfold or even more. The priority of where to use secured funding goes to fund research on how to make renewable energy sources more efficient. The secondary goal of money allocation will be used for generating the energy itself through the utilization of processes researched. Another indirect externality of the VENUSEnergy project will be the reduction of pollutants coming from plant emissions. A more efficient and green infrastructure will in the long-term be a more sustainable solution for our environment. If there’s a chance to set up a status quo when growing numbers of electricity from renewable sources can be obtained in a safe and dependable manner — the whole industry would benefit greatly. “ExMarkets is a global exchange with a fantastic presence in Europe. An IEO listed on ExMarkets will have a reach of millions of users from around the world. ExMarkets help IEOs with all stages of the process to ensure that they maximize their raise potential.” — A. Belozaravičius, CEO of VENUSEnergy. To make the cake even sweeter, VENUSEnergy project supporters and contributors will have access to acquire ‘green hashing’ power with a 20% discount than regular platform users. Oh my, to much info for me! Even if even if I force myself, I will not be able to read so much information in a week! Guys why i should choose your exchange? ELI5 please! Hey there, we tend to post the news about upcoming projects here on this thread. Will take your comment into account, use shorter updates so it's easier to read through . Well, currently we are focusing on conducting Initial Exchange Offerings (IEOs) on our launchpad and help some of the most promising blockchain projects to gain critical mass. For crypt-to-crypto trading we do not require KYC, have competitive rates, no fee for deposits and have a 24/7 active customer support. Also there's some articles in the global tech media about our exchange and Initial Exchange Offerings - perhaps you'd be interested to read and find out more. ExMarkets Team is excited to announce that we’ve onboarded one more project to our IEO LaunchPad. The buzz surrounding IEOs continues to gain momentum and we’re glad to be a part of it. 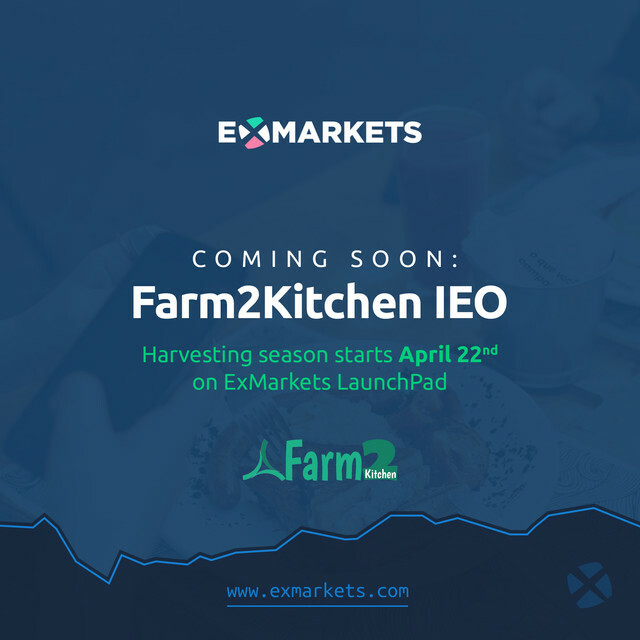 Late last week we have finalized a deal with Farm2Kitchen (F2K) project team and will be hosting their IEO for almost 2 months starting from April 22nd. F2K tokens will be available in exchange for the two most popular cryptocurrencies - Bitcoin and Ethereum their respective IEO terminals on ExMarkets LaunchPad. The foodie project token F2K (ERC-20). Farm2Kitchen is building a decentralized Farmer’s Market - the main effort is to create a system that tracks and ensures that consumers get only the high-quality food put on their table and are able to check who planted it, grew it, manufactured and supplied it. No one is surprised that the food industry is one of the largest ones out there - a man has to eat! It is estimated that 64% of all consumers indicated that they are frequently looking for healthier dietary options. Farm2Kitchen is offering a method on how to determine and be actively selective with a certain degree of confidence that you actually know what kinds of goods you are digesting - all with the help of the blockchain and its immutability. The project has grasped a lot of public attention and has been covered by some of the biggest names in the media including the Business Insider and even the ever-fashionable Vogue.